Make a small amount of saturated sodium carbonate solution (make sure its CARBONATE not BIcarbonate or it wont work. 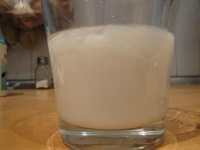 You can make bicarbonate into carbonate, as stated in the wiki page of Conversion of Sodium Bicarbonate into Sodium Carbonate) by adding plenty of sodium carbonate to water and mixing well, until no more will dissolve (100ml water is more than enough, you'll probably need just a fraction of it. Theoretically for 100ml of water you'll need around 40g sodium carbonate, maybe less). Decant your saturated solution away from any undissolved sodium carbonate and into a new container. Put your dmt fumarate in another glass container. Heat some water to near-boil, and add a small quantity of the hot water to the glass with the dmt fumarate, until it dissolves completely. 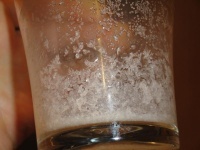 Then add a small amount of the sodium carbonate saturated solution to the container with your dissolved dmt fumarate, and you'll see an immediate clouding (which is dmt freebase precipitating). Keep adding the sodium carbonate solution until no more clouding or color changes occur, and add a bit more just for good measure. 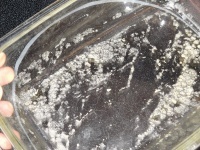 Put your container on the fridge for 3-5 days for your dmt crystals to precipitate completely. After its done, you can pour off the water through a coffee filter (just in case so that any floating crystals will be retrieved). 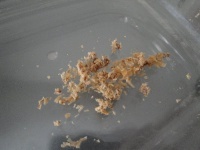 Scrape up the dmt stuck to the container, and put it on a filter or a plate to finish drying. Now you have perfect DMT freebase achieved with non-toxic solvents :). Note: The quantities here stated are what the original creator of this method used, but quantities can be adjusted proportionately to any amount. 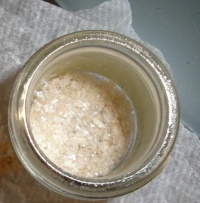 Dissolve 4.1 grams of DMT Fumarate into 25ml of near boiling water, This can be done in a 1 pint mason jar with a tight sealing lid. Slowly add the Sodium Carbonate/H2O solution into the DMT fumarate solution, normal clouding will occur. Pour the 100ml solution in over the course of about a minute. Once the two solutions are combined, put the lid on the 1 pint mason jar and shake vigorously for about ::20 seconds. If you open the jar now you can already see the little blobs of freebase DMT starting to surface and combine. At this point add 75ml of room temp H2O into the solution. Put the lid on the jar and shake again for ::20 seconds. Within :05 minute you should have a golden honey like layer forming on the top of your solution. This layer is your freebase spice. As this layer cools it will solidify. When you are satisfied with the consistency of your freebase spice you have one of two options here. First you may remove the freebase and wash it with warm H2O in a separate container, this is to remove any residual Sodium Carbonate that may be on the freebase spice. You may simply add clean cold water to your jar to slowly dillute the Sodium Carbonate mix and allow any trapped spice to harden up and make its way to the surface. Continue to add this clean cold water until it flushes all of the sodium carbonate out of the solution and you are left with your freebase spice. ATTENTION! If you choose this method make sure you have a way to capture and remove your freebase spice as it comes to the surface. Air dry your freebase DMT on a small plate and then infuse your favorite herb or vape it straight up. 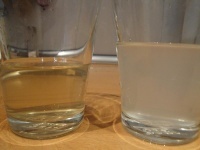 Dissolved solutions of, (left) DMT/H2O and (right) super saturated Sodium Carbonate/H2O. Center is the jar of Sodium Carbonate used. 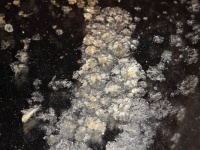 pic of the clouded combined solution after the first shake. See the honey layer begining to form out of the cloudy solution. 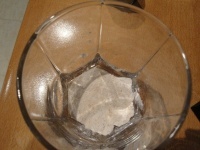 Sodium Carbonate crystals at the bottom of the jar, with freebase ring around which is collected for final yield. Add enough water to make a paste and mix well. A bit more water is better than too little water, to make sure that the alkaloids and sodium carbonate are thoroughly mixed and have gotten in contact with the water. Dry your paste completely. This can be done in a variety of ways, for example with a food dehydrator, or on top of a hotplate, or on the oven on low setting with the door open and fan turned towards it, or just in the sun. Just make sure whatever way you choose, that the temperature doesnt exceed 70degrees celcius (158f). As it dries, it will tend to form some chunks that hold moisture. Break them up to ensure thorough drying. This page was last modified on 31 August 2010, at 21:30.